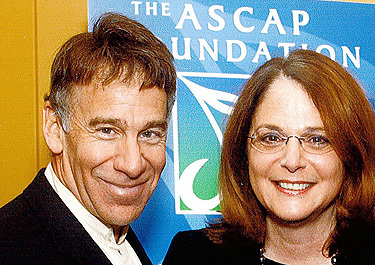 Williamson Music President Maxyne Lang and Williamson Music composer/lyricist Stephen Schwartz will be recipients of awards from the Songwriter’s Hall of Fame this year. Williamson’s own Maxyne Lang will receive the Abe Olman Publisher Award at the Songwriters Hall of Fame Annual Dinner and 2009 Induction Ceremony & Awards Presentation, which will be held on Thursday, June 18, 2009. The award is given to publishers who have had a substantial number of songs that have become world-renowned and who have helped to further the careers and success of many songwriters. When asked about it, Lang was humbled: “I am truly honored to receive this extraordinary award.” She has been president of Williamson Music since it became part of the R&H organization in 1988. Among the inductees on June 18 will be the prolific musical theatre writer Stephen Schwartz, whose career includes the musicals GODSPELL, PIPPIN, RAGS, CHILDREN OF EDEN and WICKED and movie songs from Pocahontas, The Hunchback of Notre Dame, The Prince of Egypt and Enchanted. Created in 1969, the Hall of Fame not only celebrates great songwriters, but develops new talent through master classes, scholarships and showcases. Schwartz—a great writer himself—also supports new musical theatre writers through workshops in New and Los Angeles. The “pop-u-lar” composer will also be the 12th recipient of the Pittsburgh Civic Light Opera’s Richard Rodgers Award for Excellence in Musical Theater. Established in 1988, the award recognizes the lifetime contributions of outstanding talents in musical theater. 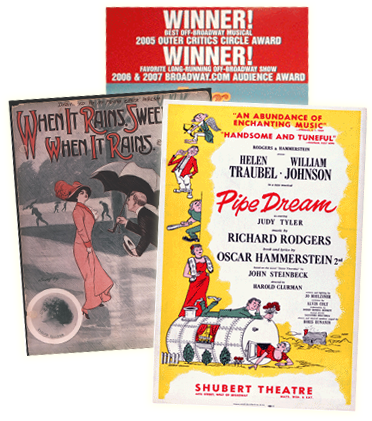 Previous honorees have included Mary Martin, Julie Andrews, Hal Prince, Stephen Sondheim, Andrew Lloyd Webber, and Shirley Jones. The Pittsburgh Civic Light Opera, along with the families of Richard Rodgers and Oscar Hammerstein II and the Rodgers & Hammerstein Organization, will present the award to Schwartz at Civic Light Opera Guild's Pink Frolic Ball on May 9 at the Omni William Penn Hotel, Downtown near Carnegie Melon where Schwartz received his B.F.A. in Drama. Our own Mary Rodgers, who composed a song for Schwartz's 1978 Broadway musical WORKING, will present the award. Mr. Schwartz’s music publishing company, Greydog Music, is administered by Williamson Music, and his musical RAGS is represented by R&H Theatricals.